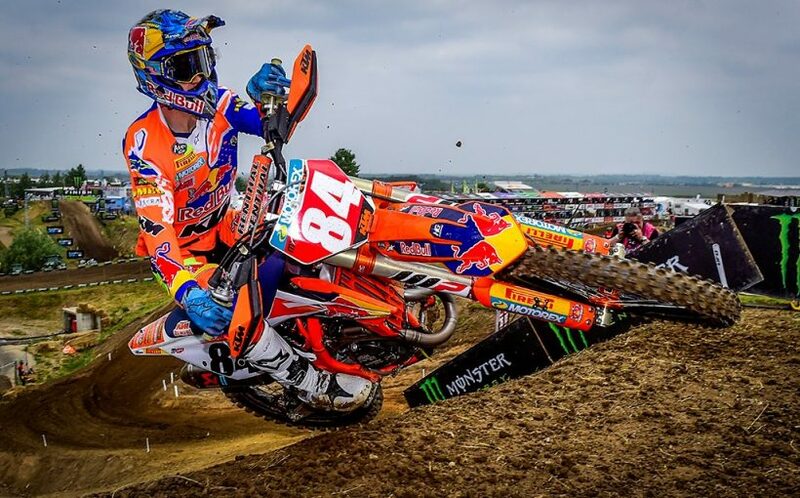 HERLINGS AND PRADO GRAB GERMAN QUALIFYING WINS. The 2018 MXGP of Germany has gotten underway on the hills of Teutschenthal! Continuing to add on to their recent success was Red Bull KTM Factory Racing’s Jeffrey Herlings and Jorge Prado as they won their respective qualifying races. There was plenty of action behind the pair of winners however with bar banging battles and even a mechanical mishap for Red Bull KTM Factory Racing’s Antonio Cairoli! The longtime motocross track held all the racing in front of the vocal German MXGP fans with great weather. On top of the MXGP and MX2 action the German fans had the added benefit of being able to watch the racing from WMX and EMX125 presented by FMF Racing. In the WMX class the first racing was again a battle between the Yamaha’s, more specifically Altherm JCR Yamaha’s Courtney Duncan and MXFONTARACING Yamaha’s Kiara Fontanesi. Even though Duncan took the holeshot, Fontanesi lead the majority of the race. The pair of title contenders battled on their way through lapped traffic but in the end Duncan came out victorious and extend her points lead. In the later stages of the day EMX125 presented by FMF Racing had their first race where KTM Junior’s Rene Hofer took his 2nd race win in a row, this time ahead of Team Maddii Racing Husqvarna’s Mattia Guadagnini and Jezyk Racing’s Eddie Wade. Red Bull KTM Factory Racing’s Jeffrey Herlings has been impressive to say the least this season and today the Dutch sensation put in another strong ride. Herlings led from the first corner after drag racing down the long Teutschenthal start and beating out Rockstar Energy Husqvarna Factory Racing’s Gautier Paulin. Paulin’s strong start placed him second but left him under pressure from Red Bull KTM Factory Racing’s Antonio Cairoli. Running behind the early top three was Team HRC’s Tim Gajser then Monster Energy Yamaha Factory MXGP’s Jeremy Van Horebeek and Romain Febvre. A strong start also helped the #77 Gebben Van Venrooy Kawasaki of Alessandro Lupino to battle inside the top ten. Lupino and his privateer Kawasaki was running in 7th just behind Febvre on the opening laps but soon come under pressure the Monster Energy Kawasaki of Julien Lieber. Lieber made a pass just before the pair returned to the start straight and Lupino then tried to retaliate by jumping long to the inside but Lieber was unaffected by the move. Next to get by the Italian was Wilvo Yamaha Official MXGP’s Jeremy Seewer. Seewer, who won the MX2 overall here last year continued his charge forward also passing Lieber. Back at the front of the field Cairoli was applying pressure to Paulin but then had a bike issue. The mishap forced Cairoli to stop and fix the front end of his machine before continuing. While the defending MXGP Champion was stopped, Gajser, Van Horebeek, Febvre, and Seewer all made it past. With only 3 laps remaining Cairoli was in 7th and unable to improve his position as Herlings took the race win with Paulin 2nd and Gajser 3rd. Monster Energy Kawasaki Racing Team’s Clement Desalle, who celebrates his 29th birthday today, had to come back from last place after a crash on the first lap. Desalle managed to take his Factory Kawasaki up into 21st and will hope to rebound in tomorrow’s racing. In the MX2 Qualifying race it was another Holeshot from Red Bull KTM Factory Racing’s Jorge Prado with his Teammate, Pauls Jonass, just behind. Chasing down the 2 KTM’s was Rockstar Energy Husqvarna Factory Racing’s Thomas Covington but he wasn’t alone, Team HRC’s Calvin Vlaanderen was shadowing the American. Vlaanderen looked good all day even scoring the fastest lap of the time practice session over Jonass by a close 6 hundredths of a second. The South African hounded the back wheel of Covington for the first 4 laps before taking over 3rd on lap 5. Running in 5th position was Kemea Yamaha Official MX2’s Ben Watson while his Teammate, Jago Geerts, was in 9th behind New Zealand’s Dylan Walsh who traditionally races the EMX250 championship. Walsh had the Rockstar Energy Husqvarna Factory Racing bike of Thomas Kjer Olsen just ahead of him on lap one but by lap 2 Olsen had made his way to 6th with a pass on F&H Racing Team’s Jed Beaton. Walsh however made a slight mistake on the 9th lap when he dropped his Husqvarna in a turn. Luckily for the Kiwi the error only cost him one position to TM Racing Factory Team’s Samuele Bernardini. Meanwhile Prado left Jonass to race on his own but Olsen was still making passes, by the finish Olsen passed both Watson and his teammate, Covington, to take 4th. Prado took the win with Jonass second and Vlaanderen 3rd.